I have been working really hard on improving my health and living a healthy lifestyle. So this Ultra Omega 3 Fish Oil is a big part of having a healthy diet. I have a very restrictive diet to maintain my health and weight loss so I use vitamins to make sure that I have all the nutrients and minerals I need. I love this particular fish oil because the pills a gel caps so they are easy to take and they don’t taste bad or fishy. I like getting the health benefits but really dislike any kind of fishy taste, so I am really glad that these don’t have that. Fish oil has a ton of health benefits including improving brain health, memory, and much much more. So the use of these tablets can not only improve your health but also the quality of your life. ISLAND’S MIRACLE ULTRA OMEGA-3 FISH OIL 180 COUNT SOFTGELS – Providing an unmatched 2,600mg per serving of Omega-3 fatty acids comprising of 650mg DHA, 860mg EPA, and 130mg other fatty acids. No other brands have this maximum dose and highest potency combination available! Also contains lemon oil for no fish burps – Best Pharmaceutical Grade.SOURCED ONLY FROM USA TOP QUALITY DEEP COLDWATER OCEAN LIVING FISH – We use only the best top quality fish from the USA in deep coldwater areas guaranteed to have the highest purity, nutritional value, and safety for you.100% PURE MOLECULARLY DISTILLED & HIGHEST ABSORPTION – By molecularly distilling our fish oil, we are able to safely remove heavy metals, PCB’s (chlorine compound found in water), and many other potentially harmful toxins. Our product is third party tested and guaranteed to have NO gluten, dairy, soy, corn, preservatives, artificial colors or flavors. NO FISHY AFTERTASTE OR FISH BURPS – We addressed this in 2 ways: 1) We added an ENTERIC COATING and 2) We added LEMON OIL. The enteric coating is designed to hold together in acidic conditions (the stomach) and break down in non-acid conditions, therefore releasing the fish oil in the intestines and not the stomach. As a secondary measure, we added lemon oil to our omega-3 fish oil to eliminate the fishy taste. So if you can’t stand the fishy aftertaste or the dreaded fish burps, look no further! 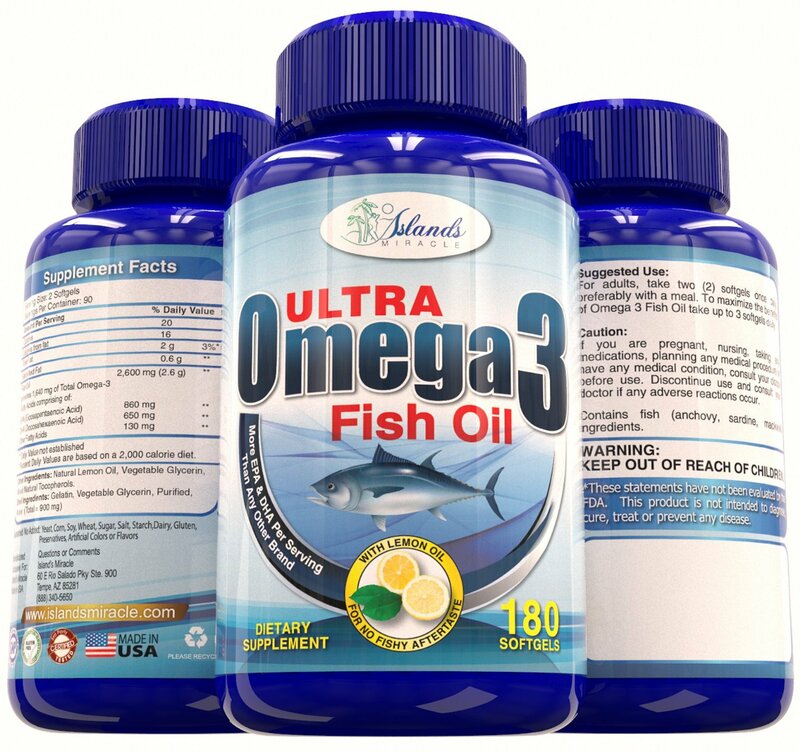 100% SATISFACTION GUARANTEE – This is the highest quality fish oil available with the highest safe dose and maximum potency available – we confidently back it up with our world class customer service and 100% Satisfaction Guarantee! You can purchse Island’s Miracle Omega 3 Fish Oil on Amazon! Now enter below to win a bottle for free! !